Something as routine as eating a bagel every morning and drinking a regular soda each afternoon can add up to 540 extra calories a day. This can result in gaining one pound over the course of a week, or about 50 extra pounds in a year. In order to prevent that outcome, a redirection must occur. Change is hard. Start small. For example, replace the bagel with a cup of fruit or even an open-face sandwich using only half the bagel. Swap out the afternoon soda with seltzer. Begin with just a few days a week if doing it daily seems daunting. These little adjustments now can save you big calories later and lead to substantial changes in the future. And once you begin to see success after making a minor adjustment, you will be more encouraged and motivated to continue adding new ones. Once you’ve started making small changes, focus on making them stick. A first step can be to reframe your thinking regarding change. When it comes to diet, many people think about what foods they need to restrict from their daily intake. Instead, see it as an opportunity to get healthier and improve your functionality as a firefighter. As tactical athletes, we must create habits that promote optimal mental and physical performance daily. Instead of attempting to cut habits out, replace them with new habits that align with your goals at work and in your everyday life. Improve hydration by placing a water bottle on your bedside table so it is already there for you to drink before you get out of bed. If your aim is to improve mobility, put a foam roller in front of the TV so you cannot avoid it before sitting down to watch your favorite show. A holistic approach targeting all pillars of performance — nutrition, conditioning, and mental performance — will lead to optimal results. Proper nutrition creates the foundation for performance. Eating well provides the fuel necessary to maximize training efforts and sustain long days on the fireground. Start with a small change, such as trying a new vegetable with your dinner, and when this becomes habitual, add another positive change to your nutrition plan. These little changes will add up and lead to health improvements. As a tactical athlete, there are countless job-related demands that require physical strength and endurance. However, with busy lives on and off the job, conditioning can be pushed aside. It is something small that can have major health consequences. Rebuild the habit of working out in incremental steps. The final component of a holistic approach to habit-formation is mental performance. This includes a broad range of skills from breathing to attention control. Mental performance skills require dedicated practice to make them strong habits that you default to in times of stress. For instance, practice one minute a day of deep breathing – an inhale of five counts and exhale of seven counts – and over time work up to a 15-minute session. Once you feel the benefits, you will start to use the technique in high-stress situations to help you regain focus and improve your physiological response to stress. As you gradually create healthy habits, you will begin to feel the positive impact on your overall health and performance. Making positive changes to your nutrition, conditioning, and mental performance will help you maximize performance, attain goals, and sustain long-term health and wellness. This can be life-saving for you and those you serve and protect daily. Levy, Allison.“Unhealthy Doesn’t Happen Overnight: Building Healthy, Sustainable Habits”.www.nvfc.org. Firefighter Strong, Issue 2. pg 18-19. According to the United States Fire Administration, 1,000 firefighter line-of-duty deaths (LODDs) have occurred in the United States between 2005 and 2014. Of those, “stress and overexertion” (defined by the United States Fire Administration (USFA) as cardiac, cerebrovascular, and climatic thermal exposure in nature) were blamed for 513 or 51.3% of these deaths (See table 1). This statistic is alarming and illustrates the dire need for us as firefighters to place primary focus on improving our personal physical fitness. 1. Being fit for duty is the most basic requirement for every firefighter--both career and volunteer. 2. 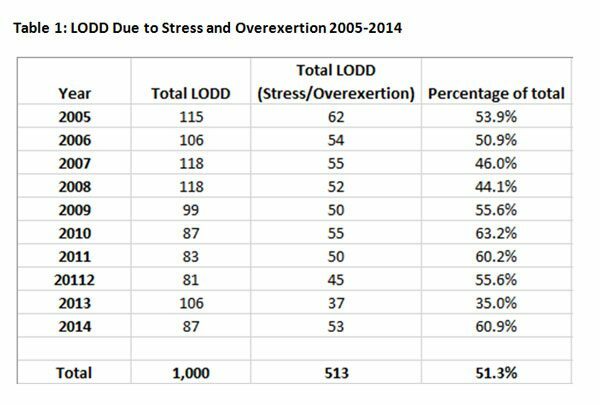 Improving personal fitness will play a large role in reducing the number of LODDs that the fire service suffers each year, specifically those caused by medical and cardiac issues. The question remains: What is the best way to improve our fitness as firefighters? Some experts emphasize the importance of improving our cardiovascular capacity. On the other end of the spectrum, some firefighters may only choose to lift weights, neglecting other important aspects of their fitness. A holistic approach to improving our fitness, specifically a functional fitness approach, is the best solution. You may have heard the term “functional fitness” before, but what does it means to be a firefighter who is functionally fit? Functional fitness is a method of fitness that uses real-life activities and positions to best prepare you for optimal fireground performance. In other words, fitness training must directly reflect of the level of dynamic fitness required for the fireground. Within the realm of firefighting, thinking about functional fitness training in terms of “the Big Eight” will help you improve your ability to execute basic fireground tasks, reduce the occurrence of injury, increase resiliency, and improve the recovery process. “The Big Eight” encompasses three general fitness fundamentals: flexibility/core strength, cardiovascular capacity, and strength training. By adding the fourth fundamental, nutrition and lifestyle, you can begin to develop a roadmap to optimal firefighter functional fitness. Flexibility and core strength are often the most neglected areas of firefighter fitness. However, improving these elements has been shown to decrease the frequency and severity of sprains and strains, according to a research study performed by Matthew T. Anderson (2002). Think about it, when you are working on the fireground, not only do you exert yourself beyond normal limits, you are also maneuvering your body and working in some of the most awkward positions imaginable. In firefighting, proper body orientation to the task at hand is not always possible. Since you do not have the luxury of proper technique all the time, you must ensure that your body is flexible and that you maintain a strong core. This will help reduce the frequency of fireground injuries. There are many approaches to obtaining a strong core and increasing flexibility. From a holistic standpoint, yoga is a very effective medium for improving both flexibility and core strength. Some firefighters may roll their eyes and scoff at the idea of doing yoga because they believe it is not challenging or applicable to their fitness. After participating in yoga for the first time, however, most will admit that it is quite the workout. Yoga has been shown to increase muscular endurance, reduce muscular fatigue, increase flexibility, reduce stress levels, and improve core strength. When engaging in strenuous fireground activities, firefighters frequently meet or exceed their theoretical maximum heart rate. Even the fittest firefighters experience extreme strain on their bodies while on the fireground. Stretching attack lines, carrying heavy equipment, performing ventilation, forcible entry, rescuing a victim--all of these activities elevate the heart rate and require a tremendous level of cardiovascular fitness. Improving cardiovascular capacity off the fireground will help your heart, lungs, and body perform longer and harder when you are in the heat of battle, and it will also help you to make better decisions while on the fireground. As Dr. Richard Gasaway has shared in his Situational Awareness Matters program, an increase in heart rate will start to affect decision-making abilities for the worse. When you improve your cardiovascular capacity through regular exercise, you train your body to maintain a lower heart rate and recover faster when performing fireground activities. There are two primary ways to improve cardiovascular capacity: 1) High-intensity interval training and 2) endurance-based cardiovascular training. High-intensity interval training (HIIT) combines alternating periods of intense anaerobic exercise with less intense recovery periods. HIIT is very similar to fireground activities: perform a high-intensity action (i.e. stretching/advancing an attack line) balanced with lighter to moderate activity (i.e. flowing water from the attack line). Incorporating HIIT into your workouts is simple. If on the treadmill, run at a faster speed (e.g. near sprint) for two minutes and then slow down to a moderate speed (fast walk/light jog) for the same amount of time or less. The goal is to increase work capacity, endurance, resilience, and recovery in a manner that supports fireground functions (relatively short bursts of high intensity, strength-reliant work). To do this, rapidly elevate your heart rate for a brief period of time and then let it recover for a brief period of time. Repeat these cycles for a total of 20-40 minutes. In addition, kettlebell complexes, sledge hammer forcible entry simulations, sprints, front squats, and stair climber sessions are all also suitable HIIT exercises. Strength training is the third fundamental component to functional fitness. Firefighters tend to traditionally equated strength training to “lifting weights.” However, your functional strength should directly relate to your ability to carry, lift, drag, push, and pull. Therefore, a firefighter in full personal protective equipment with a set of irons and the water can add 124 pounds to their base weight, and that’s just carrying stuff. These numbers may seem alarming, but they are a realistic indication of the physical strength required of a firefighter. There are various other ways that we can build strength and therefore improve functional fitness. While it is critical to lift heavy things in order to get stronger; it’s also important to focus on the areas of the body (muscle groups) that demand the most out of us, such as the legs, shoulders, triceps, lats, and grip strength. Perhaps one of the most practical methods of improving functional fitness is by putting on turnout gear and SCBA and executing the same tasks that you perform on the fireground. Instead of “hitting the gym,” head to the training ground to master the basics: carrying, throwing, and climbing ladders; forcible entry; stretching and advancing attack lines; search and rescue; rapid intervention crew drills; and so on. Combine these tasks into circuit-style training for a good workout that also builds muscle memory and tactical proficiency. Think of your overall fitness like an iceberg: 30 percent of its visible mass is above the water--this would include exercise/physical activity. The other 70 percent of the iceberg’s mass is below the water (unseen). The latter is representative of your nutrition, medical conditions, and behavioral/mental health. It is these “unseen” areas that will have the greatest long-term impact on your overall fitness, especially if you are aiming to lose weight and keep your blood pressure and cholesterol under control. You can work out all you want, but if you only eat cheeseburgers, fries, and junk food, you are still putting yourself at an elevated risk for high cholesterol, hypertension, and coronary artery disease. As mentioned before, these are the predominant killers of firefighters. You will be better off if you improve your diet and pay attention to your mental acuity and overall stress level. Strive for balancein your nutrition and a balance in your life--“everything in moderation,” we like to say. Balance an intake of healthy fats, proteins, and carbohydrates with plenty of fresh fruits and vegetables. Additionally, take some time away from the job every once in a while to focus on family, friends, and other recreational interests. Doing so will lower stress levels, improve quality of life, and subsequently improve job satisfaction and performance. The very foundation of fitness is movement. So the first step is to get off the couch, get moving, and encourage those around you to do the same. Once you are motivated to do this, you can focus on what will help you perform the job at your maximum capacity. Taking a functional approach to fitness will benefit you the most in what you do on the fireground. To achieve optimal functional fitness, strike a balance between flexibility/core strength, cardiovascular capacity, strength training, and nutrition/lifestyle. Neglecting any one area will keep you from reaching your full potential and may adversely impact everyone’s fireground safety and performance. We must train like we fight, and fight like we train. Lead by example and apply positive peer pressure to those around you, emphasizing just how important it is to take care of yourself. At the end of the day, your exercise regimens and lifestyle choices must reflect the fact that so many lives are affected by your personal level of fitness: your citizens, fellow firefighters, and most importantly, your family. Take a moment to visualize a firefighter in action. Picture someone carrying a heavy ax with a big coat and large helmet? Did you notice the thick oxygen tank on their back, or the big boots? Well, the ax weighs close to 20 pounds, and the oxygen tank can weigh up to 50 pounds, depending on how full it is. Imagine carrying all of that while sprinting through a fire!